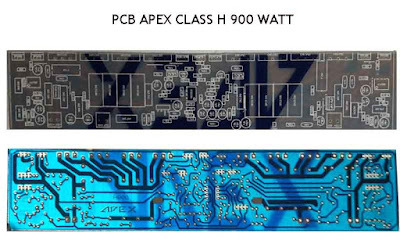 APEX H900, Power Apex is very efficient and flat on all frequencies so we can place this apex anywhere as we want it, either mid high, mid vocal, mid bass or sub low of course although a bit complicated but the satisfaction of assembling class H will be paid when we've listened to the results his sound output power amplifier. This power in claims can produce the power of 900W RMS 8ohm, 1200W RMS 4ohm, 1600W RMS 2ohm. H900 will taste ability when you used to drive speakers with a size of 21 "by 2 pieces per channel (4 ohms) then you will really get audio sound really steady, powerful and classy. Resistor 1/4W: 3K3 x1, 10K x1, 33K x1, 43K x1, 47K x1, 4K7 x6, 22K x4, 1K x3,1K5 x2, 100R x2, 680R x1, 330R x1, 100K x2, 5K6 x1, 22R x1, 150K x2, 56K x3, 390R x4. Resistor 2W: 4R7 x5, 22K x2, 3K3 x2, 2K2 x2, 6K8 x1. 0R22 5W x 8. Capacitor Elco: 10uF/16V x2. 10uF/63V x2, 22uF/25V x3, 2u2F/25V x2, 47uF/25V x2. Capacitor Ceramic: 47N x5, 10N x1, 100N x4, 150pF x2, 100pF x2, 470pF x1, 33pF x1, 22pF x1. Diode: Zener 15V x3, BAV21 x 3, 1N4148 x2. Transistor: 2N5401 x2, BF421 x1, MJW340 x2, MJE350 x1, MJE15033 x1, MJE15032 x1, 2SC5200 x4, 2SA1943 x4, MOSFET IRF540 x4. IC: NE5532 x1, IR2117 x2. A and B: The function is as a facility to bridge the amplifier, making it easier to bridge the amplifier just add the switch only. For this Power Amplifier circuit is a type of power class H, which requires a step voltage supply. To make it easer assembling this APEX Audio Amplifier we share the PCB design. 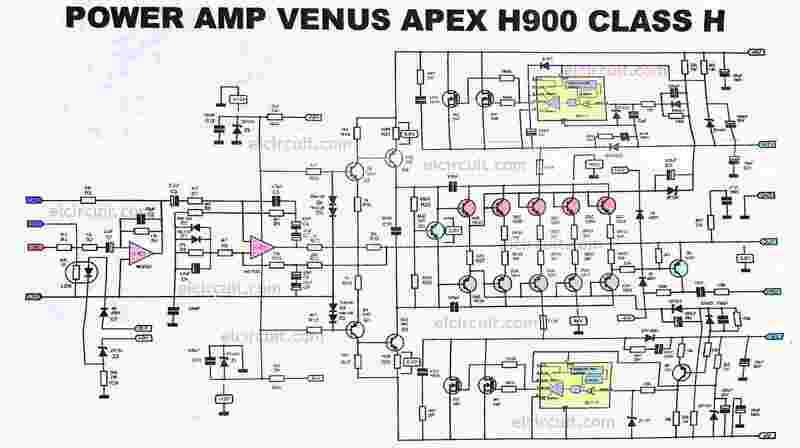 This Power Amplifier Apex H900 is the development of Apex H900 power amplifier by Mr. Mile Slavkovic. is not recomended if you use 32v . step voltage is required.